Noida Institute of Engineering & Technology, Greater Noida has entered into a Memorandum of Understanding (MoU) with Pega Systems on January 5, 2018. The MoU was signed by Mr. Raman Batra, Executive Vice President, NIET and Mr. Sridhar, Chief Digital Officer, TalentSprint in presence of Mr. Sarada Satapathy, Sr. Manager – Technical Enablement & Pega University Academic Program, Pega Systems and Mr. Giridaran, Director – Business Development, TalentSprint. 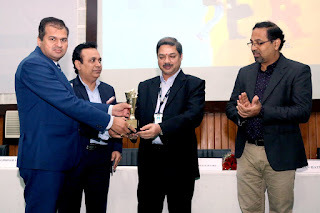 In addition, Dr. O. P. Agarwal, Managing Director, NIET, Dr. Neema Agarwal, Additional Managing Director, NIET, Dr. Ajay Kumar, Director, NIET, along with all the HODs were present for the event. The MOU aims to train students over Pega’s adaptive, cloud-architected software which is built on its unified Pega Platform. Pegasystems Inc. is the leader in software for customer engagement and operational excellence. Pega Platform empowers people to rapidly deploy, and easily extend and change applications to meet strategic business needs. Over its 30-year history, Pega has delivered award-winning capabilities in CRM and BPM, powered by advanced artificial intelligence and robotic automation. Accredited by NAAC, Noida Institute of Engineering and Technology (NIET) is an acclaimed institute offering high quality education to all section of students. It is emerging as a centre of excellence, imparting management & technical education and generating competent professionals with a high degree of credibility, integrity and ethical standards. Wishing a great success for this endeavor to both the MoU partners, Mr. Sridhar, Chief Digitall Officer, TalentSprint, termed the MoU a timely step in the right direction and congratulated NIET for its’ outward looking approach. He went on to add that considering the shape of things to come in future, such kind of proactive initiatives on the part of NIET are worth appreciating.